Gyokuro (Japan) - 2 oz. Contains high antioxidant level of 7.65% vs 5-6% for mass-market teas. Character: Full flavored, satisfying & lightly refreshing. Vegetative with some briskness. Gyokuro is referred to as "history, philosophy and art in a single cup." Japan's best green tea (made from single buds picked only in April/May). 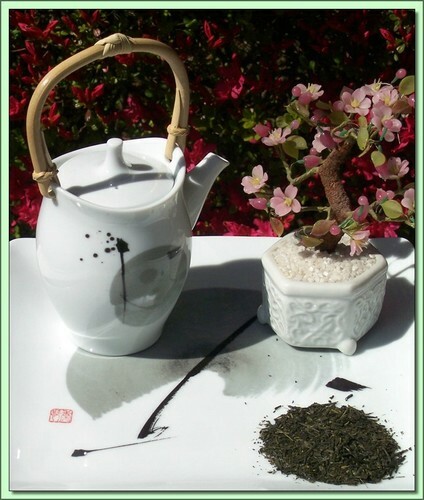 To develop increased chlorophyll (making them dark green) and reduce tannin (giving a sweeter flavor with no bitterness), the tea is covered with bamboo and straw shades for 3 weeks in early spring. The leaves are small, extremely fragrant and tender. After plucking they are steamed for 30 minutes to seal in flavor and arrest fermentation, then fluffed with hot air and pressed and dried to 30% moisture content. Repeated rolling occurs until tea develops long thin dark green needles and is dried to a 4-6% moisture content. Hot Tea: This tea is best enjoyed by pouring 180F/90C water over the leaves (1 teaspoon per cup) for 3 minutes (longer=stronger). Suggest warming cups with water first. Don't remove the leaves. Can be infused repeatedly 2-3 times using higher temperatures & shorter infusions until flavor is exhausted.